Suggestiveness is a desirable quality to have in feng shui, because it can engage us and connect us to the built-form (having Ganying or mutual resonance). But suggestiveness should not be too to the point and kill our imagination; instead it should have some “vagueness” that we can fill in with our own thoughts when we look at an object. This remains me of the famous calligraphy done by the Qing scholar Zheng Banqiao 鄭板僑 (1693–1765)，when he wrote the four characters “Nan De Hu Tu” 難得糊塗 or “It is noteasy to be “vague””, I would like to think the last two characters “hu tu” as having the connotation that is not too clear in such a way that we can make it complete with our own imagination rather than just the thoughts of the creator of the object. 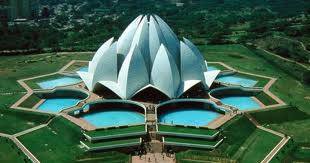 The difference between the Delhi Lotus Temple and the Sydney Opera House showed below the four characters is the former only suggest one thing – a lotus flower, whereas the latter has many possibilities that we can connect to with our own imagination and it makes our senses come alive just looking at it. One architect is a craftsman and the other is an artist and we can observe from the feng shui of their creation.